Research shows that people who weigh themselves more often, lose more weight. However, getting too invested in the number on the scale can be “crazy-making.” It is impossible for weight to go down steadily every day. Instead, look at the trend of the numbers as evidence as to whether the habits or strategies you are using are working. Success is not based on a number, but instead success is defined by the process of working on our habits. This is Shift #5 in The 15 Shifts to Becoming a Real Loser Series. I knew I was a heretic. Like Copernicus informing the world that the earth went around the sun. At one of my last team meetings in my corporate job, a bunch of health coaches were talking about how to coach people about the scale. The first coach talked about how she tells patients to do it once a week. This allows them to see progress, but they don't get caught up in the day-to-day ups and downs. In the past, people were told that they may become obsessive or depressed if they weighed themselves too frequently. A once-a-week weigh-in was taught as general good weight loss practice since I entered the nutrition field twenty years ago. The second health coach said that she lets people determine what they want to do. If they feel bad about it, she might suggest weighing once a month or even using a piece of clothing as a weight loss indicator. This weigh-in approach gained traction about 15 years ago with the Non-dieting/ Health at Every Size approach. This approach teaches that there is more to health than weight, so you don’t have to weigh. Then, it was my turn to share. I knew it wasn’t going to be a popular answer. ”Well, actually I tell people to weight themselves everyday." I said hesitantly, then I paused for a moment..."But I make sure that I coach them on it first." There was silence on the phone. No bonfires or blacklisting, but I am sure that I shook up some health coaches’ ideas that day. Over the last several years, new research has come out that people who weigh themselves daily lose more weight and keep it off. In fact, in one study if you went longer than five days without weighing, your weight started creeping up. So weighing yourself often is not only a good idea, but may be essential to not only losing weight but preventing weight gain. But, many women have the mindset that the scale is like a judge in a courtroom—and a very arbitrary, stern judge at that. The number that appears on the scale condemns them to a miserable day of guilt and self-loathing. But, it doesn't have to be that way--not with the right re-framing and coaching. What has helped me and my clients is to reframe the scale as a Tool. The scale is an ESSENTIAL Tool on your weight loss journey. If you view the scale as a tool, there is no judgement involved, just information. We don’t hate the calculator when we are doing our monthly budget--even if our savings account is smaller than we’d like. When a woodworker is building something, she doesn't get mad at her tape measure if her measurements are off. She also doesn't wait until she’s done building to check her measurements. In fact, she will check quite often at every stage of the building process to ensure she doesn't get surprises along the way. Why would weighing ourselves, if our goal is weight loss, be any different? We need to measure often if we expect to get the results we want. Weighing only once a week, is like a slot machine. You never know what you are going to get. But when you check daily, you can quickly adjust. So, as the week winds down, you are closer to your weight loss goal. Most people know that to get the lowest daily weight they should weigh themselves right after waking up, after having used the bathroom, and stripping down naked. But I have had clients who weigh themselves at work in the evening with steel-toed boots on. They are just consistent about it. That’s what matters. Then, they can ask themselves the following questions… “What will I do/ adjust today to get my number lower tomorrow?” Scale time is a perfect time to envision what obstacles might arise that day and what you plan to do about them. Then be sure to write down your weight on a log or enter into an app. To make things easy, I have two printable weight logs you can download. To make things easy, I have two printable weight logs you can download. The first one has boxes where you can write down your weight every day for a month. There is also room for you to write down the strategy that you are going to use to get your weight lower the next morning. 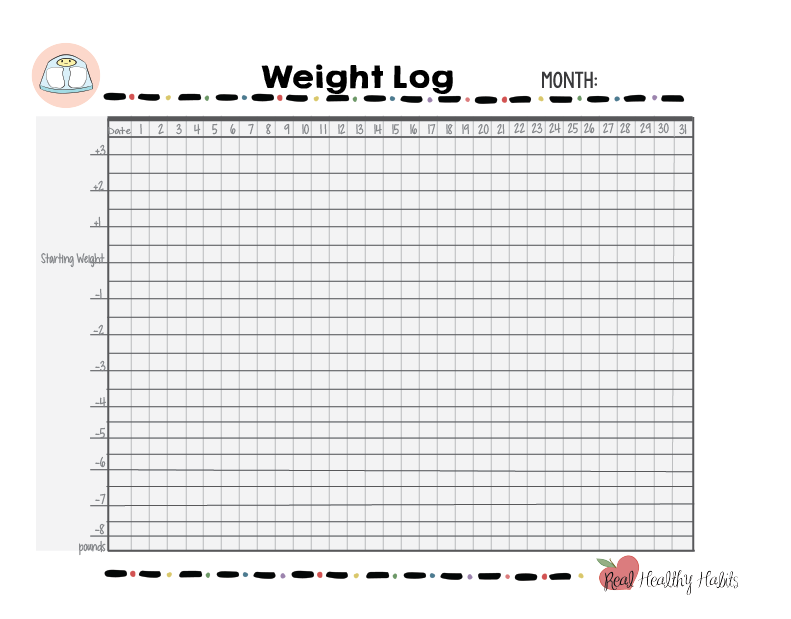 The second printable weight log allows you to graph the actual pounds you have lost in a month. If you don't want to think about the actual number and focus on the trend, this log would be perfect for you. Activity trackers or popular food logging apps like MyFitnessPal or LoseIt! are also great places to enter your daily weight. Apps that come with Wi-fi scales like a Withings scale will actually enter it for you! Use the scale to assess whether your habits are working to lose weight. Remember my post on Be a Scientist? Scientists need to measure and collect data. My science-y teenage son always asks,” Can you prove it? Where’s the data?” (usually at the most annoying of times). When you see the data from the scale, you don’t have to guess which habits are working. You will see the proof (or lack of it) on the scale. Thus, it becomes more about the process of working on habits rather than just seeing the numbers go down. My friend, Amy weighs daily and says she loves her scale. Sounds impossible, but she says that her scale has helped her to find her personal weight loss plan (or what I call Creating your own Culture). By weighing everyday, Amy could see the real consequences of every food and activity choice on her weight. She discovered that if she kept to her good habits of swimming everyday, and eating right she would see consistent weight loss. If she strayed from her plan, her weight loss would stall. Use the scale to add new habits to lose even more weight. After being on a weight loss journey for a while, weight loss will naturally plateau. It’s the perfect time to try new habits and see what they do for your weight loss. Weighing daily will help you to know how those new habits affect your weight. After being on her weight loss journey for several months, Amy’s weight loss plateaued. She decided to try some experiments— like not eating after 8:00 PM. Yep, she lost weight faster. Then, she wanted to see what happened if she waited a few hours before she ate breakfast in the morning (intermittent fasting). Again, she lost weight faster. Amy says it it took her two months of practice to feel like she really could predict the ups and downs of her weight and feel like she was in a good weight loss rhythm. After about six months, she started tracking her sleep with her Apple watch and found that getting eight hours of sleep made a huge difference in her weight loss. Getting eight hours of sleep became a new priority habit to her weight loss plan. Use the scale to get you back on track more quickly. Life will happen along your weight loss journey. Job changes, injuries, holidays, vacations, and ill family members can throw off our normal habits. But, weighing daily can keep us on track— or at least, help with damage control. Amanda was a client of mine who had been weighing daily, and found that she gained three pounds during Thanksgiving. Because she found out right away that her weight was up, she was able to keep it from being 5 or 8 pounds. It had taken her a whole month to lose those darn three pounds. She decided that the extra desserts weren’t worth it. She would do things differently at Christmas. She came up with a plan to avoid anymore holiday gain at our next coaching session. Use the scale to break down your weight loss journey into much smaller steps. When you weigh daily, you will stop noticing the actual individual number and start noticing the trend instead. I have clients who instead of seeing a looming 50 pound weight loss journey ahead of them, they just see the next tenth of a pound. Then, they celebrate with each tenth of a pound lost. Use the scale to strengthen your willpower and resist impulsivity. Bet you think I said everything there was to say in my blog posts on Willpower-- part 1 and part 2? Not even close! When you weigh everyday, it reminds and reinforces the sub-conscious part of your brain that weight loss is on the list of goals for the day. Stepping on the scale daily reinforces the connection between that number and your choices for the day. You may start pausing before giving into an impulse because you know that the consequences of that choice will show up on the scale, and you want the weight loss more. The reason weighing yourself daily helps you to lose more weight is because you remind your sub-conscious that although eating that cheesecake would be great, seeing the scale go down and meeting your goals would be an even better reward. Willpower challenge solved by the scale! Now obviously, the scale is only one tool in our weight loss tool belt. There are definitely some limitations and considerations of the scale to be aware of. If you have an eating disorder or history of an eating disorder, follow the advice of your doctor or therapist about whether you should weigh yourself or not--and if so--how often. The scale will not always move how you think it should or how you would like it too. It is impossible for your weight to go down steadily every day. The scale sometimes seems to be on a time delay. Some people tell me that they can see changes consistently from day-to-day, but I know for me, at times that scale is telling me what happened a week ago. Hormone fluctuations, bathroom habits, how much salt you had, or who knows what else can keep us from seeing a day-to-day picture of what happened the day before. Just remember to look at the trend of to see whether the habits or strategies you are using are working. The scale does not tell you about body composition. If you are exercising regularly, you should also track your measurements with a tape measure. If you are losing fat, but also increasing muscle, the scale may not move, but your pants may be getting smaller. It helps to avoid scale frustration if you also track your measurements. If you're using the scale as a scientist to evaluate which habits work, it helps to be consistent from day-to-day. Scientists change one variable at a time in their experiments. In the real world, this is harder to do, so of course keep that in mind. Plus, one day of not getting enough sleep may not affect your weight, but three days in a week might. You may not find direct relationships, but trends instead. Be sure to personalize how you use the scale. I'm all about personalizing this advice to do what works for you. If you find after some experimentation, that weighing daily does not work for you, you may want to try twice a week-- Monday and Friday. I've had clients who get great results doing this. Switch your scale to weigh you in kilograms or stones (yes, that's a thing. It's the unit of measurement that they use in Australia, Great Britain, and Ireland for measuring human body weight). If you're an American, you may have a very emotional connection to what the scale says in pounds. However, switching to kilos or stones mean nothing to you. 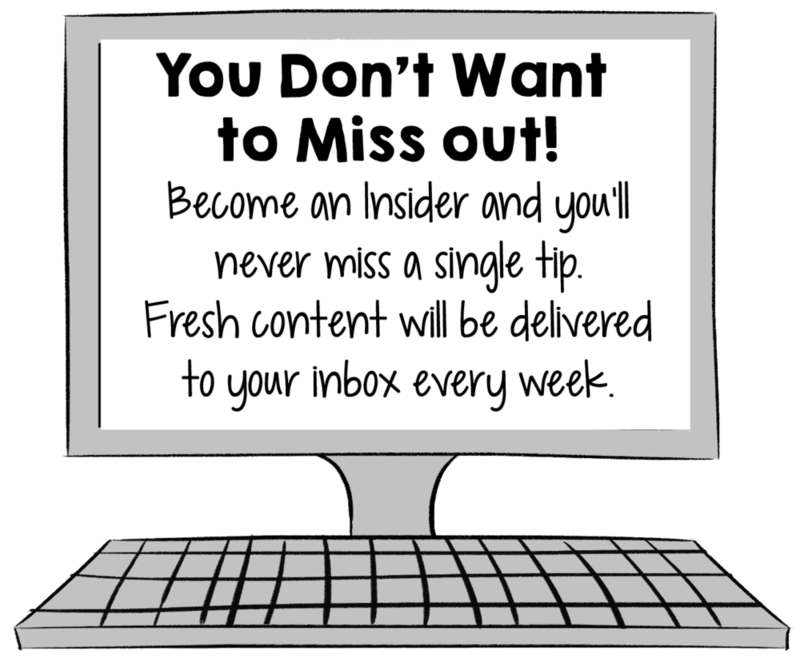 No emotional connotations, so you'll be able to better monitor if your habits are working. Alternatively, you may decide to try on a pair of snug jeans every day as a marker of weight loss. Do what works for you. Remind yourself what the number on the scale really means. In the whole grand scheme of things, there are many more important things in life. get the Guide to Losing Weight without Dieting! Hi, I’m Treva, your weight loss coach! I'm a dietitian, personal trainer, and health coach who helps women who want to lose weight, but are done with the deprivation and disappointment of traditional dieting. I help you develop a weight loss habit plan that is personalized for your body, your preferences, and your lifestyle. Want Help Losing Weight?